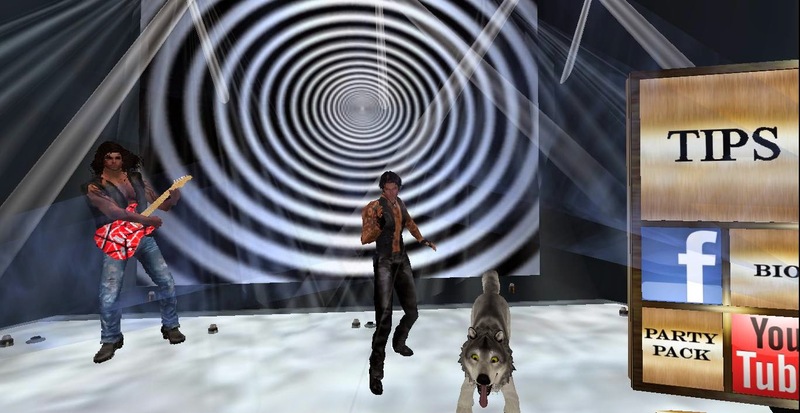 Wolfie Moonshadow is an accomplished vocalist who rezzed on the Second Life music scene in June of 2010. He completed his vocal training through the Royal Schools of Music Examining Board and his achievements include awards for Gibraltar Young Musician of the year in the Vocalist Category, MEL Best Band of the Year (West Midlands, UK 2004), MEL Best Front Man of the Year (West Midlands, UK) as well as Entertainer of the Year in Costa Del Sol, Spain. His career spans over 20 years and three countries. His energy can be felt throughout Second life as he adapts to his environments and performs for his fans. His versatile style includes a mix of several genres, including Latin/Spanish. Wolfie is a master of his craft and knows how to engage a crowd. You can tell he is in his element when he hits the stage and shares his electrifying voice. 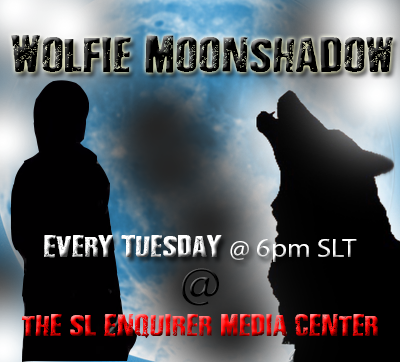 The SL Enquirer sat down with Wolfie once again to talk about the past 4 years since his first interview debut in 2010. Lanai: Hi Wolfie, I have to say it is an absolute pleasure to be interviewing you again. I’m anxious to know what these past 4 years have been like for you! Lanai: That is great Wolfie. I share your sentiment about this virtual world and the wonderful people one can meet here. Let’s begin by giving our readers a little bit of background on you right from the source. When did you begin singing and how did you find your way to Second Life? Lanai: Interesting series of events that led you here! In one sentence, how would you describe Wolfie Moonshadow your avatar? What inspired your name? Lanai: You do a pretty good wolf howl too lol. Can you tell me how your avatar is similar and different from the real you? Wolfie: My avatar is me...The real me has a different family life with responsibilities but as Wolfie, I get to be me as a performer and entertainer. This is something I have done since I can remember so second life has become the part I was missing....From the real me....If that makes any sense lol..
Lanai: It makes perfect sense. You have over 20 years experience performing for live audiences and 4 years performing for virtual ones. Can you tell me what are the similarities and differences you feel when you are on a virtual stage as opposed to a real one? Lanai: This is a unique virtual world indeed. Performers vary. Some are very comfortable on stage and others feel some anxiety right before a performance. Do you ever get nervous? Lanai: It takes courage to perform on any stage whether it is real or in a virtual world. It has to be an amazing feeling to know you bring joy to the many fans that get to experience your energy and voice in Second Life. What do you like most about what you do here? Wolfie: I love watching people having fun, on chat and on the dance hud....I love having the life as a performer in a world that enjoys what I do...and I love the people that have supported me all these years and the ones that have become my best friends during my journey. Lanai: You are a very accomplished vocalist with all sorts of real world awards and face time on television. What would you say is the most important award or recognition you have received and why? Wolfie: I would have to say the Young Musician of the Year Award...I had to prepare a piece from the Rodrigo Guitar Concerto which has lyrics...'Mon Amour'. I worked so hard on it and went up against some strong competition. This gave me confidence to continue to complete my vocal training and qualifications. Lanai: Very nice Wolfie, congratulations on that. Everyone is inspired by someone or something. Who or what inspires you the most to continue to do what you do? Lanai: I am glad you didn’t give up. I think a lot of people would miss that energy you put out when you are on stage. So, what are your most favorite songs to perform? Lanai: Well, I particularly like the Spanish music you sing. Within the 4 years you have been performing in Second Life, what has been your most memorable moment? Wolfie: LOL....Well it’s memorable alright. I was at this venue, doing a show, as you do...and was watching my screen from behind so I could see the audience and this horse walks across the screen. Well...I thought to myself, this is SL so no big deal....Then it walks up to the middle of my screen and gets up on its hind legs and starts dancing...Suffice to say that it took at least five minutes laughing uncontrollably, to calm myself down....still sniggering through my songs till I finished the show. That was sooo funny...but everyone had such a great time...Indeeed. Lanai: Hahaha It wouldn’t be Second life without moments like that. Have you done any collaborations or dual streaming performances here? Lanai: Oh yes, they are great talents too. Thank you for that exclusive show you did at SLE not to long ago, it was great! What advice would you give musicians and vocalist that would like to showcase their talent in the virtual world? Wolfie: Give your best and do not let yourself be pulled into politics or drama. Build your dreams and make them happen for the people that appreciate you as the performer you are. Lanai: Good advice. Soooo….what can Wolfie Fans expect from you this year? Wolfie: Thanks so much Lanai and look forward to seeing everyone there....Lets Paaaarty! !